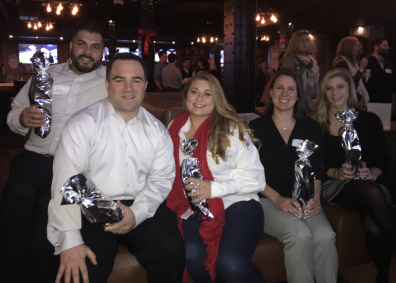 Expect Miracles Foundation’s young professionals group (YPEM) gathered with friends and colleagues on December 19 at Finn McCool’s Public House to celebrate fundraising and philanthropy in 2017. Attendees toasted to $60,000 raised by YPEM collectively this year. YPEM has now raised over $100,000 since its inception in 2014. The event also celebrated Boston YPEM winning the Kanley Cup through raising $32,000. The Kanley Cup is a yearly competition between New York YPEM and Boston YPEM to see who can fundraise the most. The money raised by Boston this year will benefit cancer research at the Belfer Center at Dana-Farber Cancer Institute, as well as our Expect Miracles Foundation College Scholarship, awarded annually to a young adult impacted by cancer. A special thanks was given to the Boston Leadership Team for all their hard work this year. Expect Miracles Foundation is very grateful for all the dedication, support, and enthusiasm they have put into making YPEM so successful. Thank you to everyone who was involved with the Expect Miracles Foundation’s young professionals groups this year – YOU are the Cure! We look forward to seeing you in 2018. If you or anyone you know would like to get involved with our YPEM group, please contact Cassidy Billings at cbillings@expectmiraclesfoundation.org. We are currently accepting applications for the YPEM Leadership Team, to learn more click here.